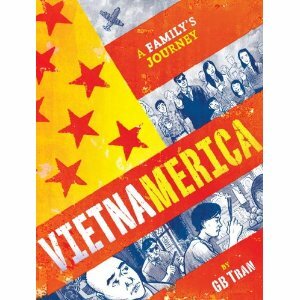 Vietnamerica: A Family's Journey is a graphic novel by GB Tran about his parents' lives in and escape from Vietnam in the 1970s and their subsequent life as refugees in the United States. GB grows up in America, distant from his parents. 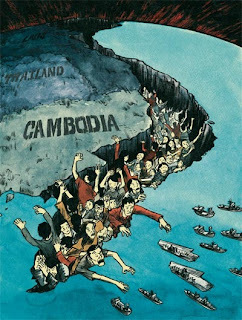 They don't tell him much about their lives before coming to the US, and as much of their family is still in Vietnam, he has no way of learning more about them. His father is intimidating and unapproachable and his mother often threatens to leave him, but never does. He hears, so many times, "You will never understand" and it is only after traveling to Vietnam with his parents as a 30-year-old that he realizes just how much he will never know. I was very intrigued by the premise of this book because the Vietnam War is one of those subjects that you never learn much about in school, but that had a huge and profound impact on the American psyche. I was very interested to learn more about it from the Vietnamese perspective and to do so in graphic novel format was an added bonus. And while I enjoyed the pictures, I think they also gave me the most trouble. I had difficulty differentiating the characters. There were several, and the storyline went back and forth in time without much help to the reader. Also, the narrator and the person being spoken to changed many times and I had trouble keeping up. I got very confused as to who the narrator was at times, what year the narration occurred in, and who the narrator was speaking to. The pictures (for me) were of no help in this situation and I often felt very frustrated. While this did not ruin the story for me, it did make me feel very disengaged and removed. I enjoyed this book as an introduction to the Vietnamese experience in the second half of the 20th century, but it didn't quite meet my expectations. wThe Vietnam ar is one of those topics that I find endlessly interesting, so it sounds like this might make a good read for me. But on the other hand, the fact that the drawings are a little confusing and that the POV shifts are not handled well might be something that would drive me nuts! I am going to have to check this one out in person and see what kind of feeling I get from it. It sounds like it might be worthwhile for the story it tells alone. 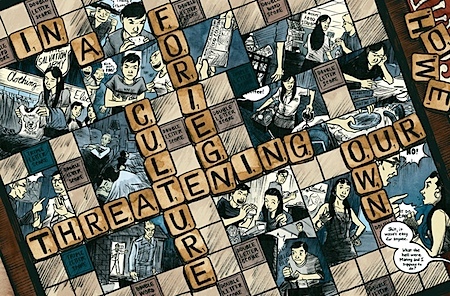 Thanks for your honest and thoughtful take on this book! Interesting critique. I really like though that the subject is treated by a graphic novel - maybe more younger people will get interested enough to pursue finding more out about the war. Jenny- Yes, same! Someone told me that not only the color, but also the font will be differentiated in the final version, so that would ALSO be very helpful in terms of timelines. Zibilee- Yes, it really is a fascinating time, I think. I feel it's a good idea for you to see the finished product in person, too- I hear there are good changes being made that might make it way easier to understand. rhapsodyinbooks- That's a good point! I hope it's the case. It's too bad about the quickly changing narrator and confusing artwork, because other than that this sounds excellent. But I'm glad to hear you found it work reading all the same! I'm quite interested in the subject matter but being that I am a "newbie" to the graphic novel this one may not be the best choice for me.